Ahead of her now-confirmed PPV match Alexa Bliss, Trish Stratus returned to WWE last night in a segment on Raw. 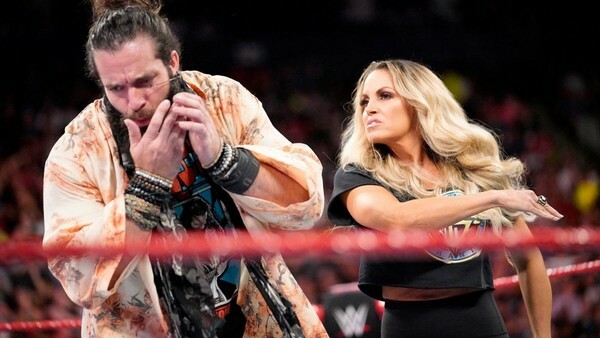 The seven-time WWE Women's Champion, who was last seen during the first-ever Women's Royal Rumble in January of this year, interrupted Elias during the show's musical segment; taking exception to his insults of her hometown of Toronto. After verbally sparring for a few minutes, Stratus then slapped him after he made a comment about her age. "I don't date women in their 60s", he told the 42-year-old. Stratus also began her war of words with Alexa Bliss ahead of their forthcoming of October's Evolution PPV. The pair had been rumoured to be having a match on that card for a number of weeks, and this was confirmed earlier in August. The Bliss segment concluded with a match between Alicia Fox and Natalya, with Stratus joining Rousey in the latter's corner, and Bliss and Mickie James in the former's. After retiring from wrestling in 2006 Stratus has carved out an incredibly successful career in yoga, and has recently made a string of convention appearances with Lita.